Today I’m joining in with Dolly of Substance and Style’s Fancy Friday series. The idea is to encourage people to dress up on a Friday, rather than dressing down. It flies in the face of the idea of “casual Friday” and is all about kicking up your heels at the end of the week. Each week, I’ll be sharing an outfit on Fridays that’s a little bit fancy. If you’d like to join in, that would be awesome. You don’t have to get all gussied up in a ball gown each Friday, just wear something that’s special to you. Feel free to interpret the concept of Fancy Fridays in a way that works with your style. My first Fancy Fridays outfit is special for a few reasons. Firstly, it’s features a lot of new-to-me items that I’ve never worn before. Secondly, it’s almost entirely comprised of vintage items. 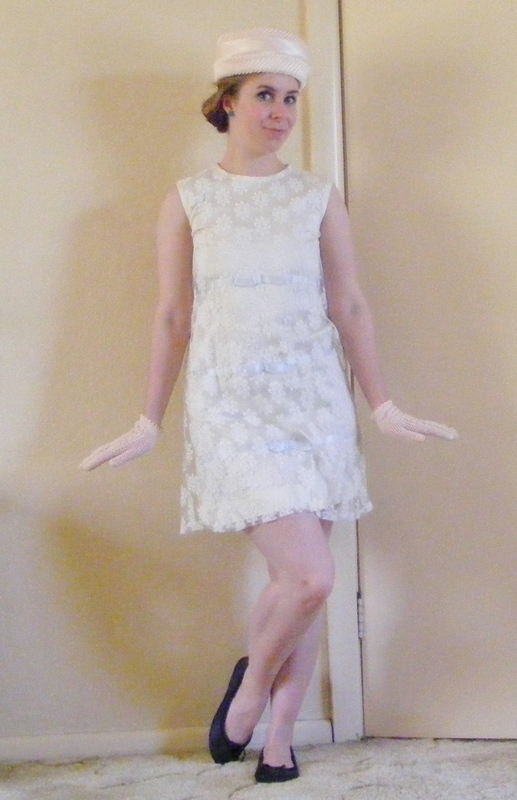 Thirdly, all those items come from one of my favourite decades to steal inspiration from: the 1960’s. This dress has been kicking about in my wardrobe since June. It was a birthday present from my parents and I was so excited to unwrap this. I’ve been wishing for a 1960’s shift dress forever, and this one was perfect. 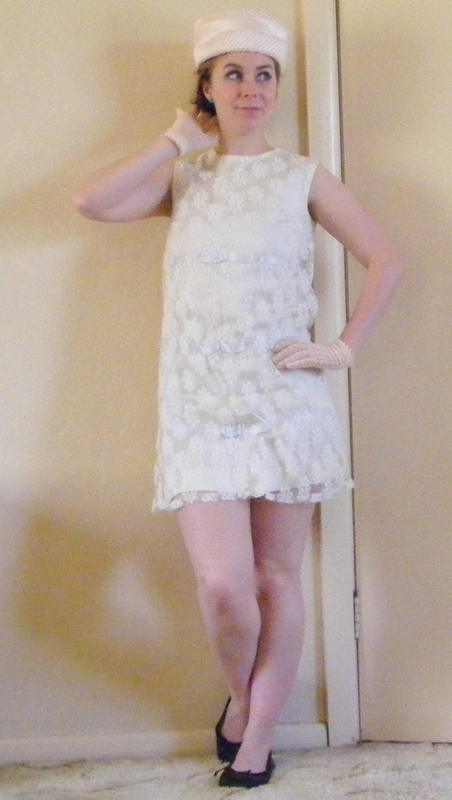 It’s very short, but I’m perfectly happy to show off my legs in this lace beauty. The only thing that worried me a bit about it is that it only just fits me. Although I love 1960’s styles, my slightly hippy figure means that I don’t always fit into them. These straight-up-and-down shift dresses were designed for more boyish figures, which is part of the reason that I’ve struggled in the past to find one that will fit me. This one clings quite tightly to my hips, but not uncomfortably so. When I was trying it on, I realised that if I gained ANY weight in the future, then this dress wouldn’t fit anymore, so I debated whether or not to get it. I didn’t want to ask for an item that I might only be able to wear for a year or so. But then I noticed that at some stage, the previous owner had taken the dress in quite a lot, and didn’t cut off the excess material. This means that in the future, if I do gain weight then I’ll be able to let the seams out with ease and the dress will still fit. Awesome. My pillbox hat was an op-shop find. Again, I’ve been after a vintage pillbox hat for years and I was ecstatic to find this one for just $7. The gloves turned up in a different op-shop three weeks later, for $2. They match the hat perfectly and I couldn’t wait to wear them together. What are you wearing this Friday? Oh wow I adore your outfit! 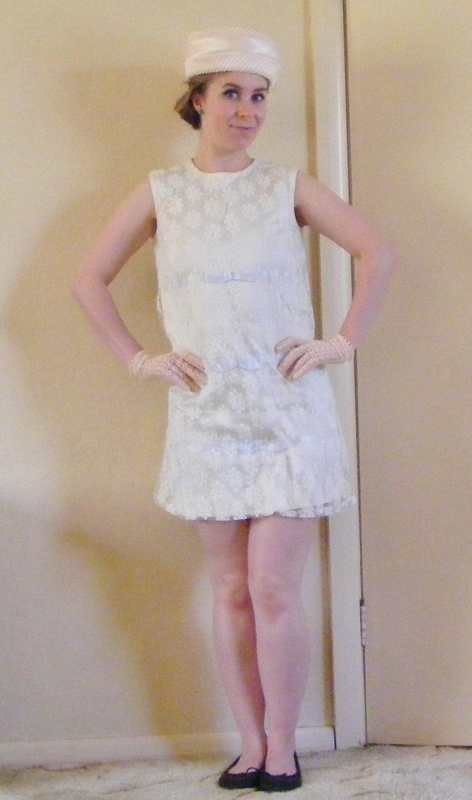 The perfect 60’s outfit from head to toe it’s so cute! It’s great that you can let it out again if you need to, I always like like finding items with the excess material left inside as well, those ladies certainly were savvy. I haven’t quite reached Friday where I am but when I post I’ll include your link and a pic to help advertise. Thanks for participating and sharing, your look is very inspiring! Thanks so much. I had such a great time with this post and I can’t wait for next Friday.